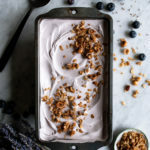 Sharing a blueberry lavender ice cream today with a sweet, crunchy hazelnut crumble. 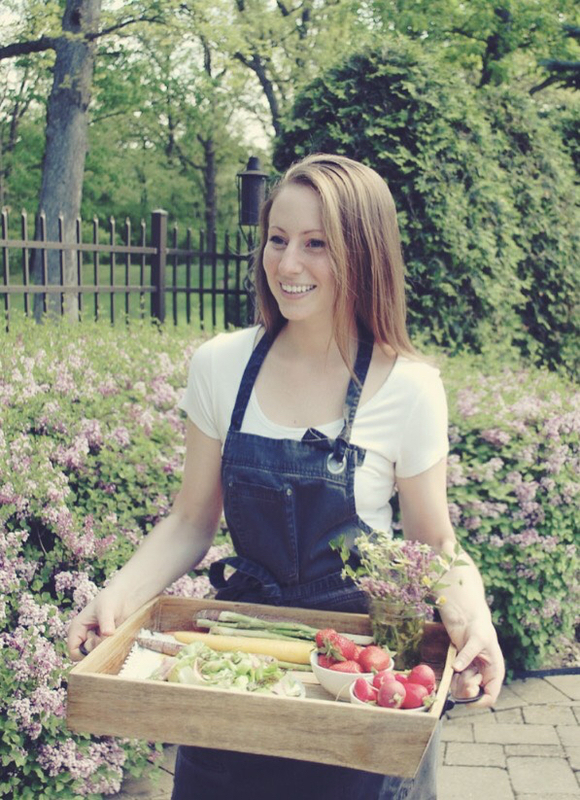 It’s the perfect spring or summertime treat! And it happens to be one of my new favorite recipes on the blog. I recently got a Cuisinart Gelateria ice cream maker from Sur La Table, and it is a game changer. I will never go back to the “making ice cream with no ice cream maker” hack I had used before (which by the way is pretty genius and involves pouring the ice cream custard base into a zip-lock bag, flattening and freezing it, then blending the semi-frozen custard in a food processor until creamy, and then freezing again until firm). But, with the Gelateria, all that work seems daunting. So now, I just freeze the machine’s ice cream container overnight, pour the ice cream base into it, run the machine, and within 15-30 minutes I have the most unbelievable ice cream I’ve ever tasted. And not to mention…a much higher quality ice cream. The texture alone is so dreamy. You’re going to love it. This recipe’s flavor combination is one of my favorites. Blueberry and lavender. Sweet, floral, and charming. Perfect for this time of year when the flowers are blooming and all you want to do is be outside with a bowl of ice cream. I’ve added a hazelnut crumble for a crunchy topping. It’s delicious. If you make this recipe, definitely leave a comment or tag me on Instagram! I’d love to see what you create. Combine the blueberries, sugar, lemon juice, and crushed lavender in a saucepan. Over medium heat, let the mixture come to a boil. Lower the heat and simmer for about 5 minutes until the liquid has slightly reduced. Transfer the mixture to a blender and blend until smooth, about 1 minute. Pass the blueberry puree through a strainer and set aside. Combine the half & half and heavy cream in a medium saucepan. Heat this mixture over medium-low heat until just simmering (do not boil). While the liquid heats up, whisk the egg yolks vigorously in a mixing bowl until pale yellow. Add the sugar, whisking well until incorporated. Temper the egg yolks by slowly whisking in about ⅓ of the heated cream mixture into the bowl. Once incorporated, pour the tempered eggs into the saucepan with the rest of the cream mixture. Cook until the custard thickens and coats the back of a spoon, about 8 minutes over low heat. Pass the custard through a strainer, transferring it to a glass or stainless-steel bowl. Whisk in the vanilla extract and blueberry puree. Place the bowl into a larger bowl full of ice water to let cool slightly before refrigerating and cooling completely. Pour the cooled custard into an ice cream maker and process according to the machine’s instructions. At this point, it will be just past the soft-serve stage. Eat immediately or transfer the ice cream to a freezer container (I like to use a non-stick, 9” by 4.5”, 1-pound bread pan), wrap in plastic wrap, and freeze until your desired texture. Preheat the oven to 450F. 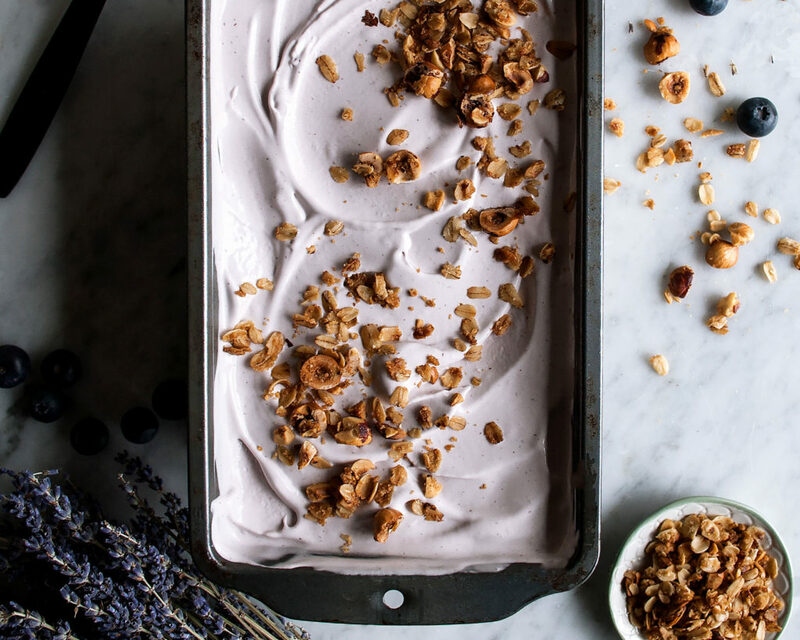 Spread the hazelnuts out onto a baking sheet. Roast in the oven for 7 minutes. Let the hazelnuts cool just enough to handle. Use a kitchen towel to rub the skins off the hazelnuts. Discard all of the skins. Roughly chop the hazelnuts. In a mixing bowl, toss the hazelnuts, oats, melted butter, brown sugar, and a pinch of salt until well combined. Spread the mixture back onto the baking sheet. Cook for 8 minutes in the oven, tossing the mixture half way through so that it doesn’t burn. 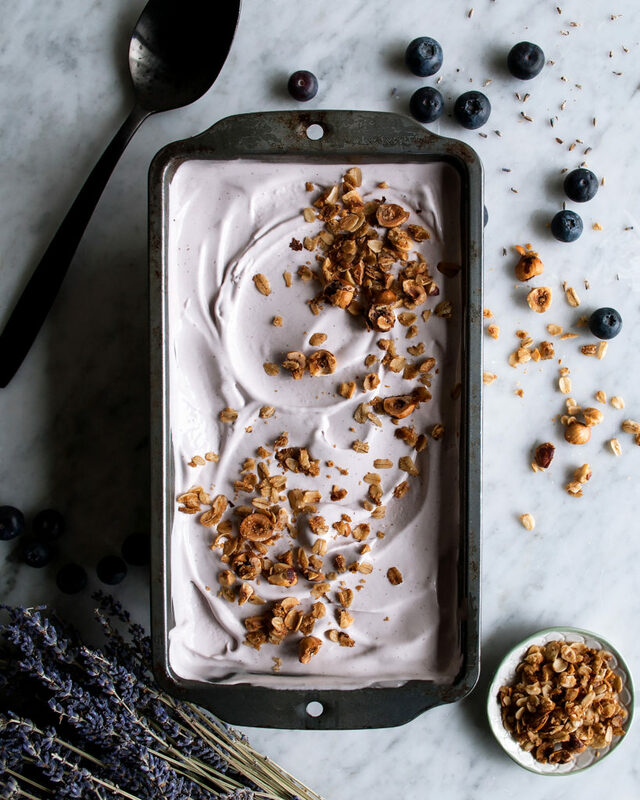 Sprinkle the hazelnut crumble on top of the blueberry lavender ice cream as a topping.